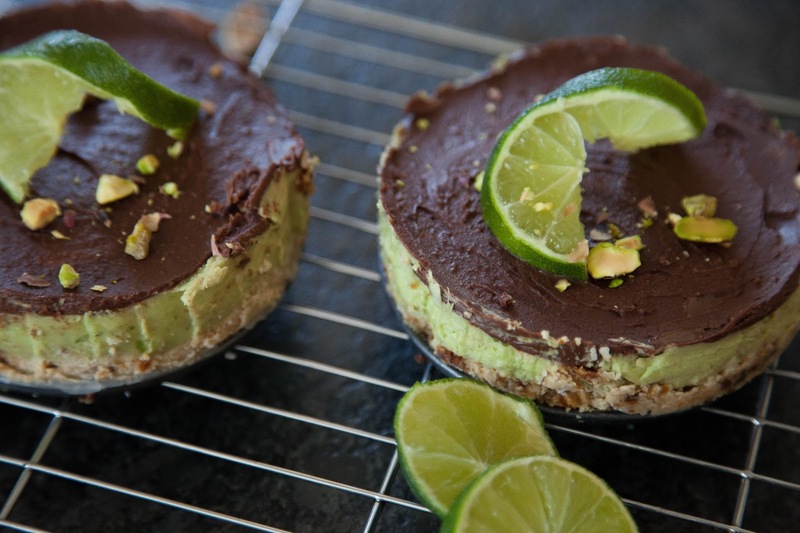 Sharp and sweet key lime pie with a date oat crust, avocado and coconut filling and a dark chocolate top. 1 tablespoon softened coconut oil. – Grease the cake pan(‘s) with a little coconut oil. -In a food processor combine the oats, desiccated coconut, oil and dates until they form a crumb. -Press the date oat and coconut mixture into the base on the cake pan and place in the fridge to set. -In a high speed blender (I use a nutri-bullet) place all of the filling ingredients and blend until smooth. -Pour the filling on top of the crust and put the pie back in the fridge to set again. -After allowing the pie to set for around an hour, melt the coconut oil and cacao together and whisk until smooth. Then pour this final layer on top of the filling layer and place in the fridge to set for the final time. -After allowing the pie to set for a further hour you can remove from the cake pan, slice, serve and enjoy.